Connect Avocode web app with Atom to inspect designs inside your text editor and to get code suggestions from layer styles. How to connect Avocode with Atom editor? Open your Atom editor (you can download it here). Go to Install and type in "avocode". 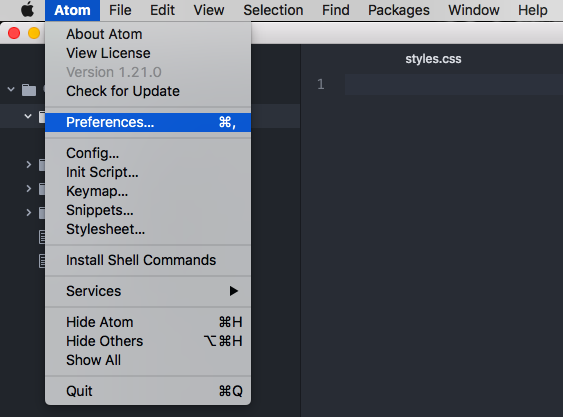 Press CMD/CTRL + SHIFT + P and type in "avocode" and choose how you want to open Avocode inside you Atom editor. Click on a layer and the CSS displays in the Avocode code panel on the left. Click back to your CSS style sheet and type for either a name of the selector or a specific property like width, you’ll get a suggestion which you can autocomplete by hitting Enter. Press CMD/CTRL + SHIFT + V to import a whole code snippet of a particular layer. Less, Sass, Less, SCSS, Stylus, React Native, CSS in JS, Styled Components, Swift, and Android. Click the cog wheel icon in the code panel (on the right) and select your preferred language. To customize the code output (reorder code lines and hide properties) please read this article.